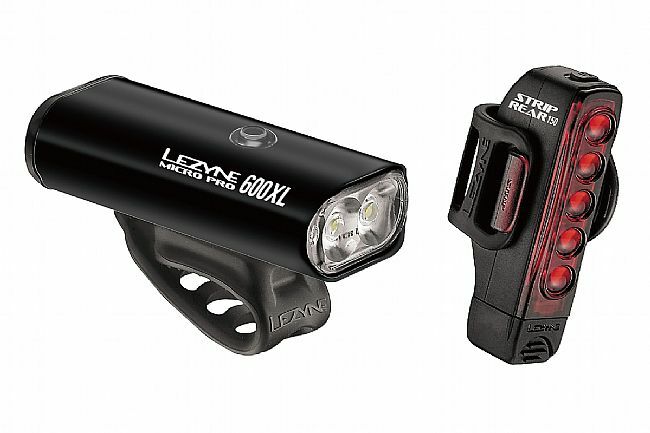 Lezyne's Micro Drive Pro 600 Front / Strip Drive Rear Light is a powerful bike light combo featuring high-output LEDs, compact and durable construction, and a variety of modes that ensure visibility any time of the day or night. The Micro Drive Pro 600 features a lightweight, heat-dissipating machined aluminum body. With 8 modes of flashing and static illumination that span 15 to 600 lumens, it’s easy to adapt to changing environments. The Strip Rear Light contains 5 ultrahigh-output LEDs within lightweight, co-molded construction. It offers 11 modes of flashing and static illumination and cable-free micro-USB charging via the integrated USB stick. Both lights have built-in side visibility, Mode Memory Function, and sturdy, versatile mounting systems which are compatible with both aero and round tube designs. 8 modes ‒ flash & static. Round & aero bar compatible. 11 modes ‒ flash & static. Round & aero post compatible. Weight: 69g (w/o strap mount). Great price and a promoter of safety to boot! Most drivers are looking for other cars and see right past cyclist,Many different options for strobe patterns and light intensity. These lights help get their attention and keep you safe. Bought this for my daughter that commutes to work on her bike. Great lights for a safe ride. Sturdy and waterproof. Light is perfect for the evening commute home. My only ding is the rear light strap is, apparently, easy to lose. After a week she ordered another. The front light is no issue.